HDS Hitachi Data Systems produces a wide range of technologically advanced storage products and complementary software solutions. Not only that, but the company also offers several services for its clients. · Virtual Storage Platform – this is a storage platform aimed at the high end market with a focus on consolidation for enterprise storage as well as IBM mainframe needs. It includes the virtualisation of external and internal heterogeneous storage within a single pool and it can manage all types of data. · Hitachi Unified Storage VM – this is a unified system that offers enterprise storage virtualisation for both medium and small companies. It allows for central consolidation as well as management of file, block and object data. · Hitachi Unified Storage 100 Family – this is a type of modular storage that allows for central consolidation of all file, block and object data. It offers a capacity of up to 3PB. · Hitachi NAS Platform – this is powered by BlueArc and provides integrated NAS (Network attached storage) for file sharing as well as file server consolidations. Models are available for both medium companies and large enterprises. · Hitachi Content Platform – this is a distributed object storage system which allows cloud service providers and IT organisations to preserve, store, retrieve and protect all kinds of unstructured content from a single storage platform. This is the foundation component of HDS cloud architecture. · Storage Management – this type of software enables the day to day operation, configuration, monitoring and performance tuning of Hitachi storage environments. It allows for the automation of several management processes based on a policy which will be set by the storage administrator. · Cloud Storage – the foundation of the HDS cloud architecture is the Hitachi Content Platform which can be deployed in hybrid, private or public cloud storage models. 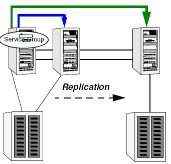 · Replication – this software from Hitachi supports in-system and remote data replication for either data migration or to meet the disaster recovery and business continuity objectives of companies. · Data Protection – this type of software from Hitachi can manage snapshots and backups. · IT Operations – this software can monitor an IT infrastructure for the simplification of IT administration including asset management, software distribution and security. Once known as HORC (Hitachi Open Remote Copy) this remote mirroring feature offered by Hitachi Data Systems storage arrays is available for IBMz/OS and open systems. · Assess and Consult – this service evaluates and assesses the IT environments of customers to determine the need to adopt new technology. It also prepares economic justifications for any investment in a new storage infrastructure. · Plan & Design – this service generates plans to meet the service level objective of a company with a basis on their current IT environment and requirements. · Install & Implement – this service uses proven methodology combined with best practice to customise, operationalise and transition the software and storage systems purchased by a customer for the quickest and most accurate deployment. · Integrate & Transition – this service uses several techniques in order to migrate data transparently to the newest Hitachi technology while ensuring that existing applications remain operational. · Manage & Optimise – this service uses ITIL (Information Technology Infrastructure Library) principles together with HDS’ best practice to manage the storage infrastructure of customers. · Education – the HDS Academy offers training courses on the products and technology across several different formats. These courses can lead to HDS Certification.